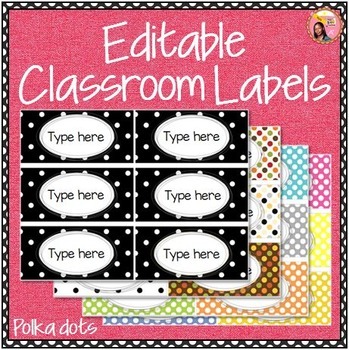 Editable Classroom Labels - Polka Dots: This set of Editable Classroom Labels (Polka Dots) are for you to label everything in your classroom. Label your library bins, stations, containers, drawers, cabinets, shelves, books, mail boxes, student trays and more. This file contains rectangular labels in two sizes: 4 per page and 6 per page. 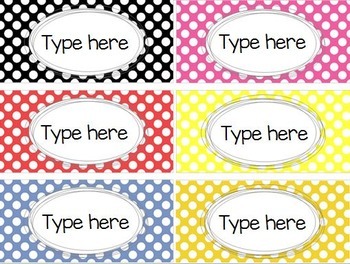 There is a whole page of black and white polka dots and other whole pages of other single colors (white, gray, pink, red, orange, yellow, purple, green, and brown), as well as other pages with a variety of multi-color rainbow theme dots, and Fall theme polka dots. They are to be printed on 8.5 x 11 (letter) sized paper. 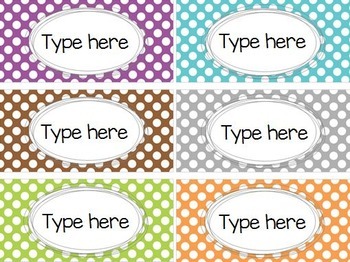 Just click in the text boxes and type your own personalized labels. This is a PowerPoint file. Please make sure that you have Microsoft PowerPoint (not PowerPoint viewer).